Desolation Sound can be enjoyed in an infinite number of ways, but one constant we often notice is that many of our guests – whether on tour or renting kayaks and going out themselves – are looking primarily to destress, unplug, and relax in a beautiful corner of the BC coast. Kayaking is often the best of both scenarios: an active vacation that physically removes you from the stresses of the modern, developed world and transports you to a remote island camp for rest and relaxation. The following 5 day kayak route has thus been developed to facilitate the above desire. Please note that in order to reach the best spots, you do have to work a little to get there! We are strong believers that the best rewards are earned through a little effort first, and so our recommendation below involves three ‘paddling’ days of moderate activity, and two ‘rest and relaxation’ days where the script is up to you. Two base camps allow a good blend of relaxation and exploration. 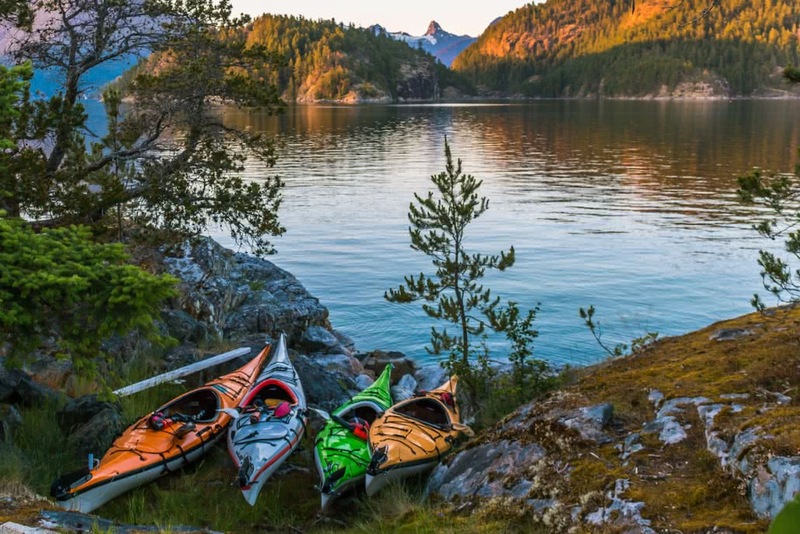 Pick up your kayaks and equipment from our waterfront location on Okeover Inlet and paddle north through these protected waters to access Desolation Sound. Check out Grace Harbour on your way north and continue up the eastern shore of Malaspina Inlet to Hare Point, where you will find a campground and picnic area on a stunning bluff for a shoreline lunch. There are minor currents in the waters immediately to the south and north of Hare Point that can run up to 3 knots at their maximum speeds, so be sure to plan your route through this area appropriately if the current is indeed working against you on this morning. Typically, keeping close to shore utilizes a number of large eddies found in Malaspina Inlet and minimizes he amount of time you need to spend fighting against the flow! After lunch, get back in your kayaks and continue north along the coast for another 25 minutes or so until you round Zephine Head and enter Desolation Sound. The Coastal Mountain Range will slowly fold into view as you come around the corner, including the dramatic peak of Mount Denman rising 7000 feet high. Depending on the wind conditions, you may choose to cross straight to Mink Island in the middle of the sound or follow the coast past Galley Bay before crossing in the lee of Gifford Peninsula for protection. Once you reach Mink Island, skirt along its southern shore until the Curme Islands come into view on the eastern side. There are three islands in the small chain that you can camp on, with more than 30 tent pads, 3 pit toilets, and a handful of kitchen areas between them, and the pads are set up so that large groups and small can share the islands together without even being aware of each others existence. The Curmes are a popular site for kayakers due to its beautiful location at the foot of the mountains and its central location in Desolation Sound, making it the perfect place to base camp for a couple of nights of rest and relaxation. From your Curmes camp you can radiate in any direction for a relaxing day paddle, or choose to stay put and enjoy a warm swim and snorkel in the warm, bright blue waters of Desolation Sound. Popular day trips include visiting Black Lake in Roscoe Bay or Unwin Lake in Tenedos Bay, both about an hours paddle from camp in different directions, and exploring the spectacular island chains in Prideaux Haven to the northeast. Personally, we like to combine an exploration of Prideaux Haven with a freshwater dip and lunch at Unwin Lake. Paddle northeast from camp into Prideaux Haven and choose your own route through the islands and islets, being sure to look for intertidal marine life and sunbathing seals and sea lions as you go. The deeper you go into Prideaux Haven, the more yacht and sailboat traffic you will encounter, so return via the small channel between Otter Island and the mainland (hint: check out the zunga, or ropeswing, on a hot day) and continue round Bold Head to the south and into Tenedos Bay. At the far end of the bay you can land your kayaks and continue to walk about 5-8 minutes along a trail into the cool forest, until you reach Unwin Lake, which is an awesome spot to swim, eat lunch, and explore the rock ledges for the ultimate cliff jumping locations. This lake warms up on hit summer days to delightful temperatures. From here, it is an easy 45 minute paddle back to camp, and a delicious meal and glass of beer or wine in the evening light. Pack you gear and get a good breakfast, because it’s moving day! Launch from the Curmes and follow the northern shore of Mink Island this time as you head west away from the mountains in the direction of Vancouver Island far in the distance. From the western tip of Mink Island, cross back to Zephine Head on the mainland and cross the mouth of Malaspina Inlet until you reach the shore of Malaspina Peninsula. There is a large beach facing Kinghorn Island on the northern shore named Feather Cove, which is an easy place to land and a great spot for lunch after an active morning. After lunch, keep heading south round Sarah Point and into the northern Strait of Georgia. Follow the peninsula south now beyond a number of small bays and homesteads until you reach a small community called Bliss Landing. Directly west of here lies the northernmost of the Copeland Islands. Watch for boat traffic here while crossing to the island chain, and you will find a campsite with more than 10 tent pads, a pit toilet and a few separate kitchen areas with incredible views of the Salish Sea and Vancouver Island. If this site is taken, there is a second site with 8 tent pads immediately to the south of the North Copeland Island which is just as scenic – and a little more protected from a northerly wind. One of our favourite day trips, the Copeland Islands are an incredible place to view marine and bird life as you pick your own path between 4 large and multiple small islands and islets in the chain. Numerous small bays and coves are found throughout the protected islands for lunch with a view of Vancouver Island and Savary Island to the south. The Copelands have a large number of bald eagles, as well as many species of shore birds and waterfowl, such as mergansers, harlequin ducks, and the tiny but diminutive marbled murrelet. The most southern island in the chain in particular has great marine life on display at low tide, including sea stars, sea cucumbers, big red spiny urchins and even gumboot chitons. If you have time and the weather is calm, a quick circumnavigation of nearby Major Rock to the west is a fascinating side-trip. This bare rock jutting out of the Strait of Georgia houses many colonies of birds, seals, and even year round sea lions! Please do not get too close to sunbathing seals and sea lions during your paddle so as not to frighten them, but no matter, as you’ll no doubt hear (and smell) them before you get too close anyway! Return to camp whichever way you choose and settle in for a spectacular sunset over Vancouver Island, and prepare for your return to reality tomorrow. Cross back to the mainland from the Copelands and paddle north back around Sarah Point and beyond Feather Cove and into Malaspina Inlet. We like to visit the opposite shore on the way back to base, so continue down the inlet’s western side through the narrow portion (where there may be more currents) and into Cochrane Bay, which is opposite Grace Harbour and another nice place for lunch. From here, you can cross the inlet to the top of Coode Peninsula at the Isbister Islets and continue south back to Penrose Bay, where you launched from 5 days and many wonderful memories ago.